I’m a full time writer and stylist for a UAE newspaper, and a part-time designer. I was born and raised in the US, and moved to Dubai when I was 14. I’ve lived here ever since, apart from studying journalism in Toronto (Bachelor’s degree) and Islamic Law in London (Master’s degree). Tell me about your fashion label and what it embodies for the modern woman. It was launched in 2011, as a creative outlet and way for me to create clothes for myself that were different from what was available in stores. It embodies stylish modesty for the modern woman – a way for her to follow runway and street style trends while still adhering to her personal values and dress code. How do you feel your designs have evolved since starting the label, and how do you find regular new inspiration for new designs? They’ve evolved a lot – each collection is different from the one before. When I first started, I was focusing on dresses and blouses, with fun prints and embellishments. 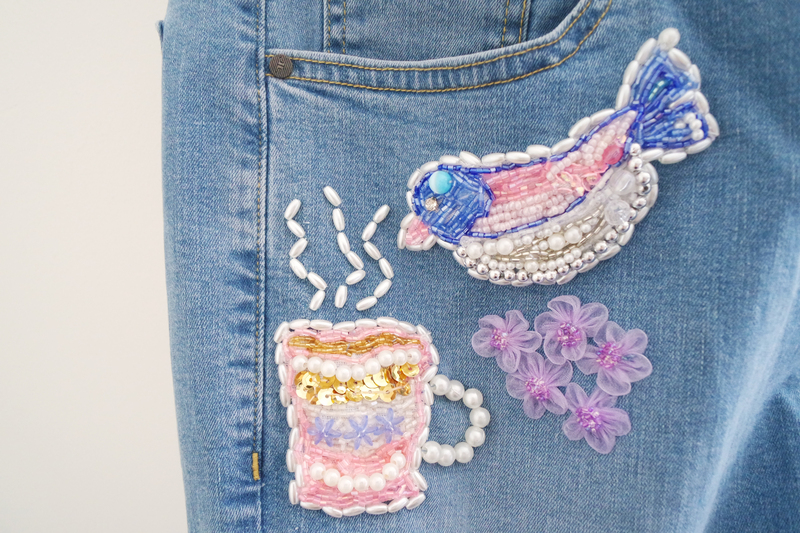 Lately I’ve been working a lot with denim and hand embellishments. I’m inspired a lot by culture and kitschy, kawaii elements. It’s always evolving, but I’d say it’s carefree, feminine and playful. 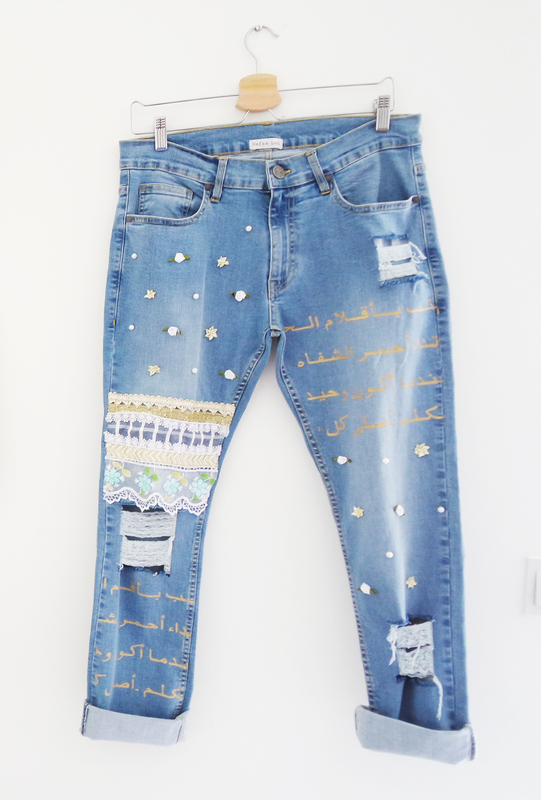 Your designs include a lot of patchwork, embellishments and Arabic calligraphy. Why is that? Who taught you to hand sew, and since when have you been sewing? My grandmother is a big sewer, and my mom also has the skill. While living in Texas, I was put into sewing classes at the age of 9, and got hooked. I took a break for a few years, but then started up again when launching my own line. What’s been the proudest achievement so far for you in regards to the brand? Every time a customer comes in specifically looking for something that she saw on social media, or saw someone else wearing, that’s a proud moment – knowing that she specially wants to buy and wear something that I’ve made, and envisioned from start to finish. The most rewarding part is seeing how they wear or style it. It is very hard keeping this up while working full time. I’m still trying to learn how to overcome that – I try to keep it manageable, with no more than 2 collections per year, and by only making a few of each piece. What materials do you use and where do you source them from? I use all sorts of fabrics, and they are sourced in the UAE and Pakistan. If you do custom orders, what’s been your most interesting commission? Due to time restraints I usually don’t take custom orders, though last week I did one – a client wanted a pair of my Arabic print skinny jeans, with embellished cuffs. She wanted one leg to have pearl embellishments on the cuff, and the other to have floral embellishments of the cuff, combining two of my designs into one. Briefly explain the inspiration and ideas behind your latest Ramadan 2016 collection. Jeans have become increasingly acceptable in fashion, and are no longer “casual” and “basic”. I wanted to revamp denim jeans and give them some personality. 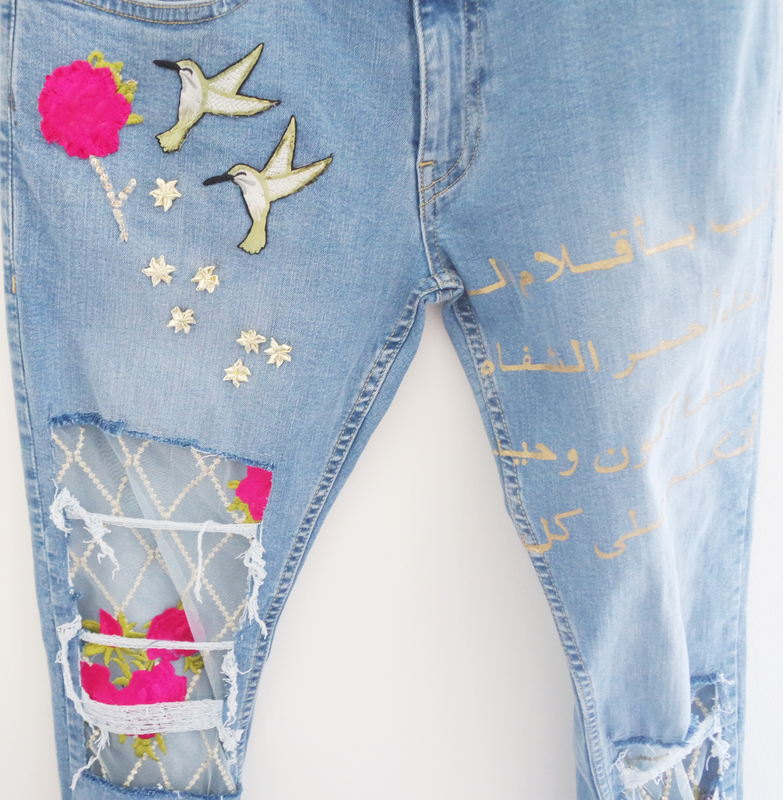 I also used lightweight denim with embroidered floral panels to create abayas, that also were versatile in that they could be dressed down and become casual, or dressed up for a more formal look. I love the distressed jeans! What is your favourite piece from the Ramadan collection, if you had to choose? Can you share something that people don’t know about you. I’m addicted (and a bit OCD) to nail polish – I have to change the colour every week! Tell me about a day in your life, as the owner of Hafsa Lodi the Label? It’s quite boring! I wake up at 8 am, get ready, drive an hour to Abu Dhabi to my office, get back home by 8 pm, sort out dinner, eat and then do some hand-sewing before sleeping. Sadly I’ve seen a lot of women buying wholesale garments from China or Malaysia, and then re-selling it here claiming they are the “designer.” If you want to start a brand, first come up with an original concept and some designs, don’t start by re-selling other peoples’ factory-made work. Where would you like to see your label in 5 years time? I don’t envision it growing much in the next 5 years, as I’d like to continue working as a writer/stylist, but I’d love to grow my pool of clientele, and perhaps expand my stockists to the UK and North America. If you are loving the creativity of Hafsa Lodi as much as me, head on over to social media to drool over more pretty photography of her work. To shop her latest collection of these beautiful pieces, simply head to @beyouboutique and @oderosedubai. All photographs are credited to the photographer Mona Al-Marzooqi and the model Dana Ahmed, and have been used by the permission of Hafsa Lodi. I love how unique her designs are! Yes, so chic and pretty! Very trendy stuff. Made a great read. Lovely design. Great needle work. I agree, I love the colours.